Solar energy has been at the center of a long standing debate on whether it truly lives up to its claim of being a self-sustaining source of energy and a wise monetary investment. While we agree that solar energy is environment friendly and reduces greenhouse emissions, many of us hesitate from adopting it for our homes. This is generally because of the many myths that surround it. Here, we will attempt to uncover a few such myths and bring to fore the facts behind them. Most people presume that setting up a solar PV system is an expensive affair that will negate any monetary benefits it yields. Fact: Installing Solar PV panels require an upfront financial investment but this pays off in reduced utility bills. In households with average electricity consumption, the solar panels will push surplus electricity into the grid, thus earning you credit. Going solar will also bring you substantial benefits from the government. Solar panels are often considered to be efficient only on hot, summer days. 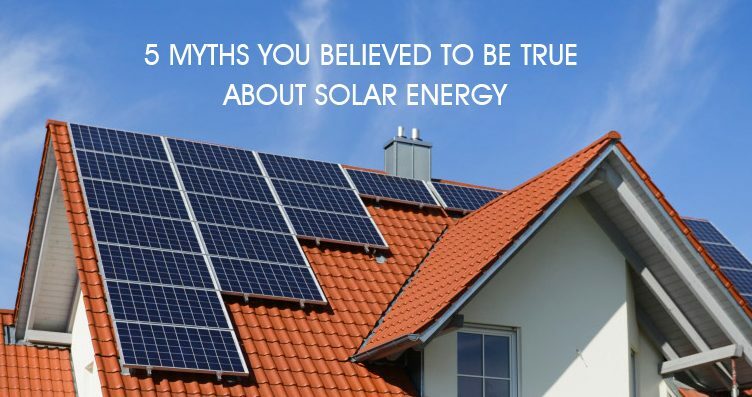 This misconception is a big reason why people shy away from going solar. Fact: Solar panels work on the sun rays falling on its surface and not on outside temperature. Even in cold winter months, you can generate sufficient electricity to meet your energy requirement. Solar panels are considered to be complex systems that require frequent maintenance and replacement, making them bothersome. Fact: The efficiency of the solar panels is optimal when its surface is kept clean and free of obstructions. But it is usually sufficient to clean it once a year. Some people fear that installing solar panels will cause their roofs to leak and may cause it to become weak. Fact: Most solar panels are mounted on supports that rest on your roof. They actually protect the area of the roof they cover. Also, agencies that install the panels will cover up any gaps with sealants to eliminate chances of leakage. Home owners often hesitate to install solar panels on their house because of the fear that it will affect the external appearance of their house. Fact: Solar panels have come a long way from the traditional, bulky designs. Today’s panels are sleek and well-designed with thin-film, non-reflective surfaces that merge with your roof. The prices of solar panels have decreased in recent years and the panels are also more durable with a warranty of 25 years. With oil, gas and electricity prices steadily increasing, solar will bring you concrete savings and prove to be a sensible investment that you can benefit from for years to come.